Boston Rob. The Robfather. Colonel Mariano. Rob. No matter what name you want to call Rob Mariano, he was the story of last night’s finale of Survivor: Redemption Island, fittingly titled "Seems Like a No-Brainer." In fact, he was the only real story of the entire season. Unless you want to give Phillip some kudos for being crazy and thus at least somewhat unique. Jeff said it best at last night’s reunion show when he called Rob’s play the most flawlessly played game in the history of Survivor. It’s certainly hard to argue. What could or should he have done differently? The only thing I can question was getting rid of Natalie instead of Grant, but Rob’s rationale for doing so makes perfect sense. Rob’s play inspired a member of the jury, David, to do something completely unprecedented. Conveniently being the last person to question the finalists, he instead took the time to lobby the jury to vote for Rob. Perhaps it was the lawyer in him, but David found it more useful to make a closing argument, in effect, for Boston Rob than ask anything of Phillip or Natalie. Ironically, David’s argument probably was not necessary. 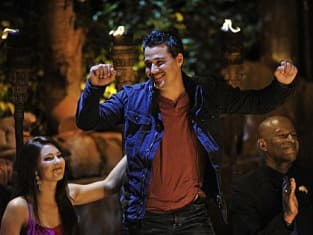 Most of the time during the final tribal council Rob either had the jury members applauding his game play (Steve) or the people sitting to his left and right praising him for getting them so far in the game. Even when the jury did attack him (Julie) Rob barely had to muster up much in defense. For as impressive as Boston Rob’s game play was this season, it worked against the intrigue of the show. Regardless of who came back from Redemption Island, all Boston Rob had to do was win the final immunity. Even if Grant, Mike or Matt came back from Redemption Island, Rob would have had no trouble convincing Natalie, Ashley and Phillip to vote them back out to prevent them from challenging him in the final immunity challenge. What was unfortunate about the people Rob was playing with was that they never challenged him. Perhaps, as David said, he had everyone so scared to cross him that they were afraid to challenge him, but none of them made him work or scramble to stay in the game. I wanted Boston Rob to win, but figured he’d have to be more creative in the process. No one stepped up to do so. The one player who I thought had a shot to somewhat challenge Boston Rob in the final was Phillip. He continuously told us throughout the second half of the season that he was playing a villain to get himself to the finals. This was something I’ve always wanted someone to try, intentionally at least. I questioned whether Phillip’s actions were intentional or not, but he was claiming they were. The final tribal council proved that Phillip was as delusional as Boston Rob always joked he was. Phillip was not playing the part of a villain to ensure him a seat next to Boston Rob. He’s just crazy. Not n-word crazy, just crazy. It worked for him in terms of getting him to the final Tribal Council, but that’s it. Instead, I wanted to see Phillip flip a switch at tribal council and say to the jury that he played the villain to get here, but it was all an act. He realized Boston Rob was in charge; he could ride his coat tails and never had a chance to oust him. All he could do from there is get to the finals and hope his version of how things could get him votes. Would it have worked? Probably not. Could Phillip have received more than one vote? Maybe. Instead Phillip continued with his scorched earth policy by attacking the jury members. He repeatedly cut Ashley off sounding like a spoiled child and went after Julie when she attacked him. Natalie was equally as useless at the final council as Phillip. Ralph called out Natalie for being unable to talk about or challenge Boston Rob without looking at him. It was something I noticed before Ralph even brought it up and thought that all it did was make Rob look even better. What I don’t understand is Julie’s comments about how, as a father, Rob needs to teach his daughters not to give in to men like Natalie and Ashley did to Rob. Exactly what did Rob do that was so despicable? Was there ever a moment when Rob was anything but a gentleman with the girls? He voice may sound a bit sleazy with the way he talks sometimes, but nothing he said or did reflected poorly on him. Besides Russell and Boston Rob, the other major twist to this season was Redemption Island. I wish I could say I’m happy to see it go, but we’ve been told it's back for another season. I’m not sure why, there was little interesting about it. The best parts were the actual duels, something they got rid of half way through the season and replaced with challenges where the only goal was to not lose. Beyond the Redemption Island challenges, the reinsertion of the players in to the game proved useless. Matt was immediately voted out in what proved to be a shrewd move. Andrea had NO chance of staying in the game coming back so late. I’m surprised Boston Rob didn’t have the “whoever comes back in the game is immediately going home” speech with the final four. As much as I loved the return of Boston Rob and Russell to duke it out one last time, I’m not looking forward to it again for next season.Having the two most notorious villains of all time lead separate tribes was a cool idea that made sense because of their rivalry. But who makes sense for next season? Now it just seems like a gimmick rather than a cool idea. Not that it’s necessary, but to prove how much Boston Rob dominated this season, who would have won if not Boston Rob? 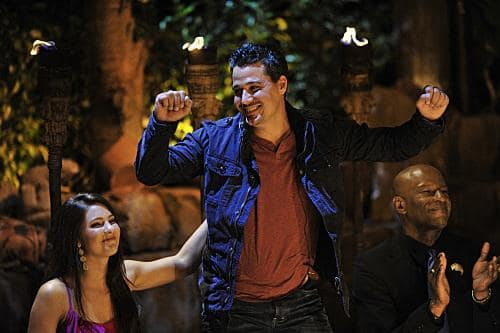 If Rob does not win the final immunity and is sent home, who wins? Ashley? Phillip? I can’t imagine Natalie had a shot. Finally we had some bizarre circumstances at the reunion show. Like why was Grant so mad at Boston Rob and why wasn’t it explained? Why didn’t we see the moment when Rob told Natalie and Ashley that he had the idol? That seemed relevant. Was that an actual human moment from Russell? Despite a predictable Survivor winner, you can’t be disappointed with this season. Boston Rob made up for any shortcomings. Besides, at least they got rid of the Fallen Heroes portion this season! See you next fall for Survivor: South Pacific! I feel like, up until right now, I'm playing my best game. Permalink: I feel like, up until right now, I'm playing my best game. Jeff: You'll have a chance to get back in this game. Permalink: You'll have a chance to get back in this game. I'm not done.